Designed as a comprehensive guide to domestic science suitable for older students, it includes chapters on all aspects of home management including ‘A Glimpse into the Science of Nutrition’ and ‘Hay Box Cookery’, as well as many common recipes. One particular highlight of these early handbooks are the many advertisements for food items, such as, ‘Rosella Jams & Jellies’, ‘Eta Peanut Butter’ and ‘McKenzie’s Coffee Essence’. 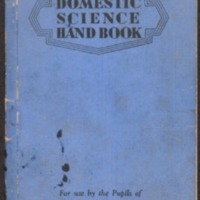 107 pages ; 18 cm.